How would you answer the question, “What effect will the Justice Department’s antitrust lawsuit against Microsoft have on the overall stock market?” A fundamental analyst might write a thesis about it, pointing out the market’s behavior after past antitrust actions and discussing why this time might be the same or different. He would remind us that we can draw no useful conclusions without knowing more about upcoming events. Many technical analysts would say that the market, digesting advance knowledge of the event, probably factored most of its impact into stock prices prior to the action. He would assure us that further events will be similarly discounted in advance. Again, though, we would be reminded that there are no useful conclusions to draw without anticipating upcoming events. Despite their differences, these responders would agree that events are causal to the stock market’s behavior. The socionomic perspective is otherwise. The report, “Socionomics in a Nutshell” (December 1999), demonstrated in brief that in the realm of economics, politics, demographics, war and even the threat of nuclear destruction, events are not causal to social mood and stock market trends. In every case, the direction of causality is the opposite of that generally assumed. The performance of the economy does not govern the stock market; the social mood as reflected by stock market trends governs economic performance. Politics do not govern the stock market; the social mood as reflected by stock market trends governs politics. Demographics do not govern the stock market; the social mood as reflected by the stock market regulates the overall rate of procreation. Changes in the threat of nuclear destruction do not affect stock prices; the social mood as reflected by the stock market affects the level of the threat. In each instance, social mood trends as reflected by stock market trends dictate the character of events, not the other way around. How, then, would a socionomist respond to the question posed at the start of this report? Before answering, let’s explore some data. In 1890, a year after a new all-time peak in stock prices that would last a full decade, Congress passed the Sherman Act, which in vague language outlawed trusts, which in fact means companies that service a large market without significant competition. Take a look at the comments above the graph of stock prices in Figure 1. Observe that the government’s antitrust suits against U.S. corporations, particularly the landmark suits that make the history books, consistently come near stock market peaks, usually slightly afterward. Often the correlation is so close as to be within weeks of a major top that leads to declines in the averages of 50% or more. Railroads were arguably the most successful U.S. industry in the late 19th century. On the run-up to the stock market peak of June 1901, the stock of Great Northern Pacific railroad, which later became part of Northern Securities Co., increased more than ten fold in less than a month. Shortly thereafter, the government sued Northern Securities Co. in the first major application of the Sherman Act. In 1906, the year of a peak that was not exceeded for ten years, President Theodore Roosevelt filed his famous suit against the country’s largest company, Standard Oil. During the Panic of 1907, the President offered no objection to a merger involving U.S. Steel when asked to do so and explicitly directed his attorney general not to bring an antitrust action against International Harvester. In 1911 and 1912, after stock prices had recovered, President Taft’s antitrust division filed suit against both companies. A month after the all-time high of 1929 and before the crash, the U.S. attorney general announced that the Justice Department would deal vigorously with every violation of the antitrust law. In 1930, the Justice Department filed suit against one of the biggest success stories of the 1920s bull market, RCA. In 1937, the year of a major top in stock prices, the government sued aluminum maker Alcoa. The antitrust movement saw little action throughout the nearly two-decade long bull market of 1949-1966/68 until the very end, when the stock market reached a top of the same Elliott wave degree as that of 1937. In 1967, the government ordered Proctor & Gamble to divest itself of Clorox, and in January 1969, a single month after the most speculative bull market peak since 1929, the Justice Department sued the country’s most successful company, IBM. From 1982, antitrust activity again virtually disappeared during nearly two decades of bull market. On May 18, 1998, just one month after the final high in the advance-decline line and the Value Line geometric index, both of which had risen for 24 years, the Justice Department sued the world’s most successful company, Microsoft. On April 3, 2000, a single week after the closing high in the NASDAQ 100 index, the court sided with the U.S. Justice Department in ruling that Microsoft had unlawfully violated the Sherman Act. Like his predecessors at prior historic turns, U.S. District Court Judge Thomas Penfield Jackson, representing the people, has pursued and denigrated Microsoft with a fervor that borders on the evangelical. His desire to break up the most successful company of all time as measured by percentage gain in value per year is a passion born of the passing of a social mood peak of even higher degree than that of 1929. As you can see from this century-long history, major antitrust suits coincide remarkably consistently with the passing of major stock market tops. More important, and typical of conventional explanations, the suggestion of a causative link between antitrust actions and falling stock prices goes against the assumptions of many other conventional analysts. Many economists believe (mistakenly) that trust-busting is good for the economy. If they were correct, and if their assumption that economic performance dictates stock market trends were correct, then stock prices should rise after an attack on a presumed monopoly, not fall. Finally, this conclusion about causality fails to answer the question of why antitrust suits are typically brought after the stock market has climbed for years or even decades to a state of overvaluation in a climate of rampant speculation rather than at any other time. For the most part, the Justice Department leaves successful corporations alone near the end of bear markets and through 90%-100% of bull markets, even if it has to wait decades to do so. What is really going on? The social mood shift that occurs at the transition from bull market to bear includes a change in general attitudes toward the financial success of others. Society moves from a feeling of support toward one of resentment. During a bull market, the social mood is directed toward rewarding achievement; during a bear market, it is directed toward punishing it. The bear market mood begins to creep into collective thinking late in a bull market. Democratic governments are instruments of egalitarianism. At some point, their representatives cannot stand watching some companies succeed wildly more than most others. When the bull market reaches exhaustion, the old supportive mood begins to crumble, and the new punitive mood bursts forth. One result of this metamorphosis in social character is governmental attacks against highly successful enterprises. In fact, they typically start with a major attack against the most successful enterprise of the time. This socionomic perspective, moreover, is quite comfortable with the fact that Microsoft stock tripled after the suit was announced. The environment of stock market tops is one of rampant speculation fueled by a manic psychology. Reason and outside-event causality are not part of this landscape. Bullish fever among speculators and righteous anger among egalitarians can coexist for brief periods as major social mood tops are being formed, thus producing the anomaly of a soaring stock price for a company that is being attacked in court by its own government. Antitrust action typically continues throughout most of a bear market. As each bear market comes to an end, the old mood of resentment evaporates. The timing of this correlation is just as remarkable as that for tops, as demonstrated by the comments underneath the graph of stock prices in Figure 1. At the 1914 low, the Clayton Anti-Trust Act reined in the broadness of the Sherman Act. In 1920, as the market was approaching the low from which the bull market of the Roaring Twenties would erupt, the Supreme Court rejected the challenge to Andrew Carnegie and J.P. Morgan’s formation of U.S. Steel, saying mere size is no offense. Near the 1932-1933 lows, the government settled its case against RCA, and the National Recovery Act suspended antitrust law for two years. Near the 1942 low, the War Production Board offered grants of immunity from antitrust action, and the government suspended many of its antitrust cases. A year after the 1949 low, the government settled its suit against Alcoa without achieving its objective of breaking up the company. In 1982, after a sixteen-year decline in real stock prices, the Justice Department abandoned its suit against IBM. Like its attacks, the government’s major acts of reconciliation and permissiveness typically occur within weeks or months of a major turn in the stock market, this time to the upside. In both cases, its acts are in response to, and part of, the changing social mood. One could try to argue that once a stock market decline goes far enough, corporate fortunes in general are so poor that there is no longer any need to punish trusts. However, if the government’s theory of monopoly power were correct, a contracting business environment would have no effect on a company’s relative position. Further, this view does not explain why in some cases the government pulls back after stock prices fall 50% and the economy is in recession and in other cases after stock prices fall 90% and the economy is in depression. There is no mathematical magic level at which governments stop their attacks. They stop when the social mood reaches bottom, wherever that may be. The exact timing and level of that event are determined not by extent or time but by form as revealed by the wave pattern. With regard to the question posed at the outset, then, the answer from a socionomic perspective is this: The Justice Department’s antitrust action against Microsoft has had, and will have, no effect whatsoever on the overall trend of the stock market (just as it had no effect on the price of Microsoft stock itself). The causality is the other way around: The exhaustion of an extremely positive social mood trend, as reflected by stock market statistics, affected the Justice Departments emotional mindset and caused it to capitulate to a desire to attack the most successful corporation it could identify, which was Microsoft. In contrast to the predictive uselessness of conventional assumptions about the direction of causality between social events and mood (see opening paragraph), the socionomic perspective allows a basis for at least some limited probabilistic forecasting. With a knowledge of the Wave Principle, we can roughly anticipate the timing of major antitrust actions and later, their resolutions. For example, we can predict that no major government attacks on corporate success are likely from the time of a stock market bottom of Cycle degree or larger through most of the ensuing bull market. We can also predict continual government attacks on corporate success from the time of a stock market top of Cycle degree or larger through most of the ensuing bear market (the later attacks typically being of lesser import than the first one). We can state further that when a major antitrust action takes place after a long period of non-action, it is a sign that the social mood trend of at least Cycle degree is likely changing from bull to bear. We can also state that when a major antitrust action is resolved after a long period of conflict, it is a sign that the social mood trend of at least Cycle degree is likely changing from bear to bull. We can say these things because antitrust actions and resolutions do not occur randomly; they occur at specific times in response to a psychological environment involving a major extreme in social mood and its reversal. First, we must define our terms. A monopoly is an entity that holds an economically preferential position due primarily to the use of force. Monopolies are maintained by the force of the state in favor of selected individuals, guilds, companies or state enterprises. European monarchs routinely granted monopolies on specific markets to individuals. Guilds successfully barred competition when the power of the state was behind them. Corporations and state enterprises such as the U.S. Postal Service, the Federal Reserve System and the U.S. Mint enjoy monopoly privileges. Persons attempting to provide services in competition with entities such as these are aggressively punished by fines and imprisonment. A monopoly differs from an especially successful company in that the latter is always at the risk of competition. Monopolies have survived for centuries despite bad products and services. On the other hand, every non-monopoly company is subject to collapse if its products or services deteriorate, if it misses the next innovative trend in its field, or if the very field it is in becomes passé. Some people claim that an especially successful company can become a monopoly simply because its success gives it power to destroy the competition. It is true that immense success can allow a company to make deals with other businesses to induce them to deal with it exclusively. This condition is different from monopoly power, however, because the dealings are voluntary. Another business can always refuse to cooperate if it so chooses; there is no gun behind the deal. Further, such power is temporary. To the extent that any successful business engages in elaborate restrictive schemes, it will, in the long run, drain its resources and weaken itself, allowing future competitors to gain an edge. Competition, moreover, is not fixed to any number of firms existing at a particular time. A successful company frets as much over potential competition as over actual competition. It knows that the slightest slip in top quality goods and services will endanger it immensely. No matter how hard it may try, no company can keep a premier position forever. The natural order of things eventually reduces the relative success of every exceptional enterprise. This distinction between actual monopolies and purported monopolies that are not is important for the purposes of our socionomic thesis regarding trust busting. It allows us to see the essence of the commonality between the suspension of government’s actions against successful non-monopoly corporations near stock market bottoms (shown below the graph in Figure 1) and its simultaneous initiation of attacks on actual monopolies. Figure 2 shows times when the U.S. government has acted to limit or break apart the monopoly power of the original U.S. phone company, AT&T. Under the Communications Act of 1934, the U.S. government dubbed AT&T a natural monopoly and allowed the communications carrier to operate without competitive forces. In 1949, the year that a 20-year bear market pattern in real stock prices (not shown) ended, the U.S. Justice Department cited AT&T for maintaining a monopoly that violated the Sherman Act. On November 20, 1974, the month between the final lows in all the stock market averages following declines of 45% to 74%, the Justice Department sued AT&T for monopolizing the telecommunications industry. In 1982, the year that real stock prices bottomed, AT&T was ordered to divest itself of all seven of its local operating companies and cease offering local phone service, which it did in 1984. As a result of that action, the monopoly no longer existed, and the telecommunications industry exploded with innovation so dramatically that in just 16 years, many of the most successful and entrepreneurial companies on earth are those associated with telecommunications. The more entrenched monopoly power of the U.S. Post Office survived the bear market of the 1970s, but it might not have if the decline had been one degree larger. In 1970, the two-century old U.S. Post Office was transformed from an agency of the executive branch of the U.S. government to a quasi-independent postal corporation modeled after a private-sector firm. At the same time, notes a “History of the Postal Monopoly in the United States” from the Journal of Law and Economics, the governors of the new U.S. Postal Service established a regulation allowing them to surrender bits and pieces of their exclusive grant to preserve the substance of the monopoly. It adopted this policy to head off a rising chorus of public attacks on the Postal Service monopoly. As the law journal history notes, the attacks themselves are extraordinary because ever since its original colonial times, the postal monopoly has seemed inviolable. In 1973, the House of Representatives convened hearings on mail delivery restrictions that had been in place for more than 150 years. In October 1974, the very month of the bottom in the S&P, the first official suspension of prohibitions on private carriage were put into effect for certain items. As a result, Federal Express, UPS and even the Postal Service itself brought a burst of innovation to the delivery industry. Congress was still debating a number of bills calling for the privatization of mail delivery as late as June 1982, two months before the final low of a 16-year decline in real stock prices. Things changed when the social mood trend turned up. In October 1982, as the Dow made its first decisive rise above 1000, the Reagan administration decided for now to de-emphasize its opposition to the U.S. Postal Service’s mail monopoly. Monopoly privileges stifle innovation, so when monopoly power is removed, an industry is allowed to develop. In contrast, upon every single antitrust action against successful non-monopoly corporations (see Figure 1), innovation did not immediately burst forth. The reason is that each of these successful companies, in a climate of free competition, was precisely the one responsible for the immense innovation that had already occurred. These disparate results confirm the difference between the two types of entities. We can now see that the principle behind the government’s actions with respect to these disparate entities is the same: At tops, the government initiates force to stifle free competition and success; at bottoms, itremoves force that has stifled free competition and success. This latter impetus takes two forms: withdrawing antitrust actions against successful non-monopoly companies and dissolving actual monopolies. With this knowledge, we again have the ability to do some limited probabilistic forecasting both in terms of predicting actions against monopolies and predicting major social mood changes when those actions occur. In the past three decades, the U.S. government has taken to bailing out losing enterprises. These actions derive from the same egalitarian impulse behind its attacks on successful companies at major social mood tops. Rather than acting to prevent success, though, the government acts to prevent failure. The overall economic result is still destructive, as saving one enterprise endangers its competitors and wastes both productive resources and tax money at the same time, but this fact is irrelevant to the socionomic observation that impulsive social mood is the engine of these actions. Following the 1987 crash and the sluggish, mostly sideways year of 1988, Congress established the Resolution Trust Corporation on February 6, 1989 to bailout a slew of failed savings and loan institutions. Its creation marked the beginning of the biggest financial bailout in U.S. history. The crisis lasted through the 1990 bear market (which brought the Value Line index down to its 1987 low and cut the Transportation Average in half) and abated by mid-1993, when the RTC had liquidated or paid off the debts of 90% of the failed institutions it had taken over. Although a bailout involves the use of force taking tax money and using it to shore up an enterprise that no one will support voluntarily it is psychologically the opposite of an attack. While free competition in fact requires allowing failure, the force wielded by the government is intended, however erroneously, to benefit competition by keeping the number of competitors in the marketplace higher than it would be otherwise. These actions, therefore, are consistent with the socionomic hypothesis that their origin is psychological. 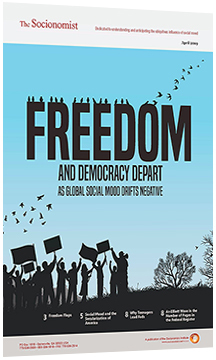 Although the data available for this report pertain to government actions, results of social mood change with respect to the treatment of corporations are not confined to acts of the state. The changes in social mood that govern antitrust action are broadly experienced by the populace and have other effects. During a major topping and declining mood trend, all kinds of sociological forces work against corporations that are visibly successful. Exactly which companies may be affected by the social mood change from bull to bear is probably unpredictable, but the mood will have its way with some entities or other. For example, in the bear market environment of the early 1970s, countless people were apoplectic over an irrational fear that ITT (the International Telephone and Telegraph company), which had begun a program of taking over smaller companies, would take over the world. It was considered an immense threat. College students fretted over it, and talk show hosts discussed it continually. ITT must have been mystified. In the end, it never threatened anyone but its own employees, as its fortunes flagged and its business focus narrowed to hotels and casinos. In 1998, ITT itself was taken over by a relatively obscure REIT. As another example, in the past twelve months, Coca-Cola has experienced both widespread panic in Europe over a supposedly tainted product and protest marches in the United States over purported discriminatory hiring practices. The panic proved to be based primarily upon fantasy, and the hiring practices under protest have been in place throughout the bull market without similar consequence. When social mood is early in a positive trend, the same thing happens, but in reverse. Can anyone really justify the deeply sentimental mood with which flavored sugar water has managed to become associated in the minds of people around the world? (For a case study on the Coca-Cola phenomenon, see the December 1999 issue of The Elliott Wave Financial Forecast.) A socionomist recognizes that the waxing benevolent mood trend associated with the bull market appears first. The objects of its focus (whether it be pop drinks or pop stars) find themselves in the right place at the right time and exploit it. Imagine the value of a knowledge of socionomics to enterprises designed consciously to harness the social mood trend. Even the one small observation presented in this paper would help the typical company. It would have a handle on when to increase its public presence and when to hold back. It would know when to push products and services attuned to the bull market mood and when to push products and services attuned to the bear market mood.